These concepts as described by Jaynes,are explored, and extended to the awareness and conciousness of our evolutionary situation, where we can recognize and analyze the potential for our own species’ extinction. Perhaps, if we be so fortunate, to forestall such, for awhile. Jung’s Collective Unconscious and Dharma concepts such as Interbeing, are explored as a way for us to climb back from beyond the brink, which, by many measures indicate, we went over decades ago, and return to living within the planet’s carrying capacity, using some semblance of logic and sharing. While there is much here that ties into our discussion of evolution, ecology, and climate, there are also aspects, that those not recognizing the speed at which we hasten change in the machine age, to see a more science fiction than fact. Let us move more slowly, more intimately, and focus on our awareness of, and interplay between, our consciousness and unconsciousness, and the role that dreams play. For now, we put off discussion of the relevant work of Dawkins and Morris, to focus on our major interest. Some background must be established, starting with Jaynes logical determination which differentiates consciousness from other forms of thinking. It may well be said, adapting the famous quote by Winston Churchill about the aerial defenders of England in 1940, that “never have so many people paid so little attention, to someone whose treatise, should we choose to study it, we owe so much.” The key here of course, is choosing to study it. Many, and likely most, students and professionals in the areas of psychoanalysis, psychotherapy, dream analysis and therapy, evolution, and more generally, science and medicine, have not paid it attention, and likely, simply not been aware of it. Why is that? And why has such important thought been overlooked? Cavanna et all (2007) wrote that Jayne’s book presented the “hypothesis of a two-chambered brain-mind model that preceded the evolutionary development of the conscious mind. Jaynes’ speculative model gave rise to a huge debate, which has reverberated throughout the current neuroscientific and neurophilosophical literature.” Perhaps this was huge among neurophilosophers, but that is not likely a very large group, compared to the overall number of mind scientists from whom we have heard very little comment. 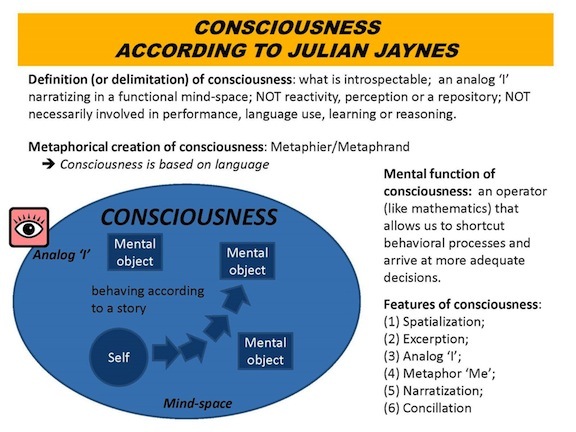 It was not long ago at all that Jaynes’ seminal work, “The Origin of Consciousness in the Breakdown of the bicameral mind“ came to my attention, despite many years of study and thought in how the mind works. Perhaps it was mentioned in passing in some textbook on ethology or evolution, or psychology, psychiatry, or neuroscience. But I do not remember such. …A popular teacher, he lectured in the Psychology Department at Princeton University from 1966 to 1990… After making significant contributions to the study of animal behavior and ethology…The unusual scope of his work spanned psychology, anthropology, history, philosophy, religion, and literary studies. Despite the parallels with Jung, there is not one index reference of him in the Jaynes text. Konrad Lorenz, a notable ethologist, also is snubbed. Freud does get three index references, the same number as Joan of Arc. Certainly “eclectic” comes to mind, but his writing awakens our brain to think in a different way. One hot summer evening, I was at a local bookstore (Kramerbooks, one of the few “brick and morter” bookstores left in Washington DC, and open 24/7 with food and drink on top of an excellent selection of books of all types- they deserve shameless plugs), preparing to fly the next day to Scandanavia. While I had previously bought a novel to read on the long flight, (Sputnik Sweetheart, by Haruki Murakami), on starting the first section, despite the wonderful prose, I thought I could not lose time I might otherwise spend in reading Jung, Freud, Tenzin Wangyal Rinpoche, or the Textbook on Psychoanalysis. That latter book could be easily ruled out, weighing 5 pounds or so, and I picked out Jung’s memoirs, thinking it “light” reading in comparison to more analytic texts by the “psychodynamic duo.” So I chose to go with the novel and memoirs. At Kramerbooks, I was not looking for anything specifically, just browsing. I came across Jayne’s work in the Psychology and Self Help section. Thought it odd, not having seen it before, and from previous visits, rather expecting what I would see. I picked it up and started reading, including back cover reviews such as Stove’s, writing “the weight of original thought is so great that it makes me uneasy for the author’s well-being; the human mind is not built to support such a burden” and Harrington’s “it renders whole shelves of books obsolete.” Thinking such hyperbole was intended to sell what otherwise may have little value, I examined rather critically the book, not expecting much. Instead, I found it very interesting, but stopped short of buying it, and instead writing down the title, intending to look it up later and perhaps buy it on Amazon. Back at home, it was time to pack, and I stuffed Jung and Murakami into my backpack. I had work to do the next morning, before going to the airport, so got to bed as early as I could (which is never early as I am a night owl). Strange but I kept thinking about the contents of Jayne’s book and some of the passages I had read. And on awakening, realized I had been dreaming of the book as well. So, despite the rush needed to get in another trip to Kramer’s, between work and the airport, I thought, OK, I can do it, quick walk to the subway, quick out and in to the bookstore, just buy it, no thinking, just do it (best way really, or at least faster), and quick back on the train and home, to finish packing and head off to skyland. Jayne’s book was the only book I would read on that trip. Jung, Freud, and many others had been pushed aside, and in fairly quick order. Yet, it took many years to come across the book. Many have speculated why, and anyone who has spent time in academia knows how it can happen, and it is an unfair and illogical situation, but all too common in the specialized departments of large colleges. Impossible, or simply beyond the interests of more narrowly focused academic specialists? But certainly, he had left the mainstream of psychology. And in thinking that Kuijsten’s book came out in 2007, with some recognition of Jaynes emerging at that time (the previous times being Jayne’s original publication in 1976 and the reprinting in 1990), I also was victim to the overspecialization of academia, being so immersed in medical biochemistry, that despite my interest in neurology and analysis, was, I must confess, too busy to have noticed. But this line of exposition must cease, to focus on Jayne’s ideals. Jaynes has had a larger impact in the field of linguistics. The following is from the website of Japanese linguist Yosuke Yanase (reference and link below). 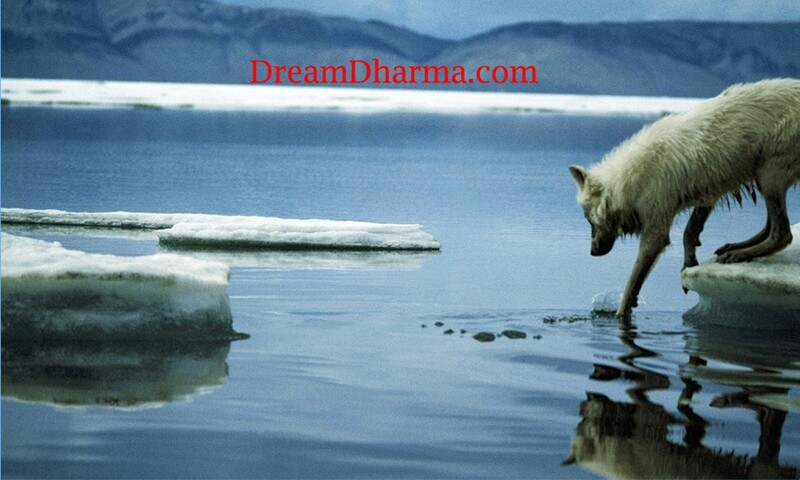 This work, like all original material in Dream Dharma written and presented by the author, is Copyright 2013 by Talmage Carawan. Every effort has been made to properly credit brief passages and photographs not my own; should an error be found, please bring it to my attention for correction. 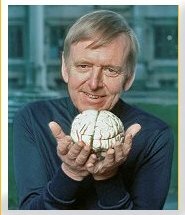 In 1976 Julian Jaynes published his controversial book The Origins of Consciousness in the Breakdown of the Bicameral Mind, introducing the hypothesis of a two-chambered brain-mind model that preceded the evolutionary development of the conscious mind. 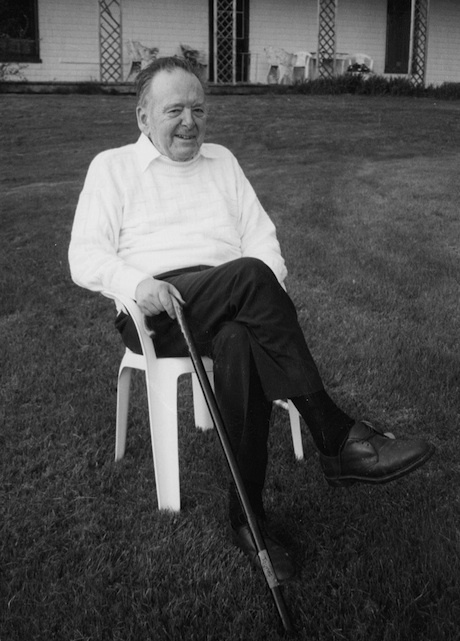 Jaynes’ speculative model gave rise to a huge debate, which has reverberated throughout the current neuroscientific and neurophilosophical literature. Has the bicameral mind stood the test of time? To answer this question, the present paper adopts a multidisciplinary perspective and, after briefly summarizing Jaynes’ hypothesis, addresses two main critical issues: the neurological basis of the bicameral model and the philological accuracy of Jaynes’ arguments. Finally, the concept of a non-unitary Self is presented as one of the most relevant contemporary legacies of the bicameral mind.